﻿ Book Gran Hotel Bahia (Bocas del Toro) - 2019 PRICES FROM $105! Gran Hotel Bahia is 1476 feet from Simón Bolívar Central Park and 2 minutes’ drive from Bocas del Toro International Airport. It features free WiFi and a free daily Continental buffet breakfast. The rooms offer modern décor, air conditioning, safety box, cable TV and city views. The bathrooms are private and include shower and free toiletries. Guests can enjoy international cuisine, local food and steak dishes in the restaurant at Gran Hotel Bahia. 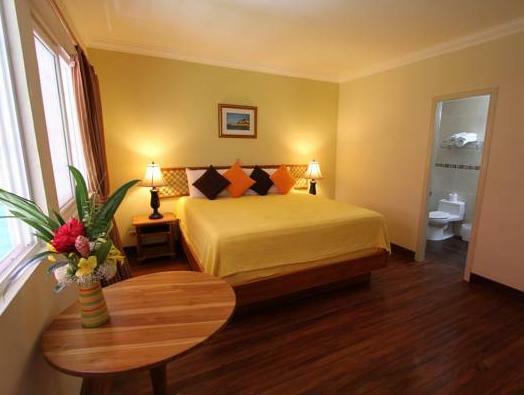 This hotel can contact travel agencies for guests to arrange tours in Colón Island. The property is 10 minutes’ boat ride from Carenero Island and 15 minutes’ boat ride from Bastimento Island.